Be sure to check out my follow-up post, which looks for ways to predict how many tickets will be sold, among other statistical fun! 1. Don’t play the lottery. It’s an easy guide that I normally follow, but like many people, I will probably buy some Powerball tickets for Saturday’s draw. The lure of the record $800 million jackpot is hard to ignore. Professor Sommers is guided by the principle of expected value, a topic I’ve explained in my Guide to Game Theory. The concept is simple: if I buy a huge number of tickets, do I expect my average winnings to be greater than the cost of the tickets? You can also think about it this way: if I had enough money to play every single possible combination of numbers, would it be profitable? I’m going to put very high-level details in this section; if you want to learn more about the calculations, keep reading after you’ve finished. In Powerball, the break-even point of expected value (EV) is when the lump-sum jackpot is about $491 million. As of this moment, the lump-sum jackpot is advertised at $496 million, and I expect it will grow significantly over the next 24 hours. Our expected value calculation shows that a $2 ticket expects to return a little under $2.02, meaning, on average, players will make a small amount of money. But there’s a big problem with this assumption, and you probably know what it is: when there’s more than one jackpot winner, the lucky players split the top prize. If two tickets share the jackpot, they’ll each take $248 million. The unfortunate thing for our purposes is it drops the overall expected value to around $1.17, meaning the average player should expect to lose 83 cents for each ticket purchased. This past Wednesday, when the jackpot was ‘just’ $528.5 million, over 175 million tickets were sold. How many people do you think will play this time around? And how many do you think will hit the jackpot? Odds are good it will be more than one. Should you choose Power Play? 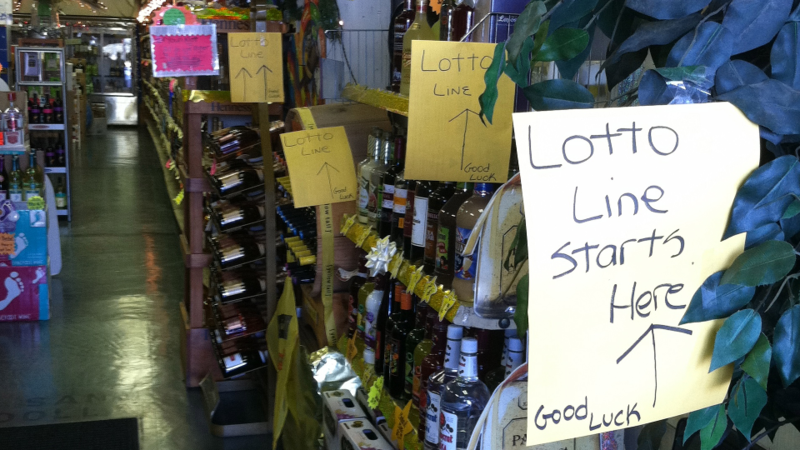 If a lottery is offering you something, chances are it’s bad for you. That is true for Power Play. Unless you’re in California, “Power Play” is a $1 add-on option that multiplies your non-jackpot winnings by a randomly selected number. The multipliers are 2x, 3x, 4x, and 5x; if the jackpot is under $150 million, 10x is also a possibility. The expected value of the multiplier is 2.767 when the 10x is in play, and 2.595 when it’s not. On average, Power Play will return about 50 cents or 46 cents, respectively, making it a big loser when you’ve paid a dollar to play. Power Play is only a “good” deal – compared with the regular game, that is – when the lump-sum jackpot is under $175 million. If you’ve been reading The Final Wager for a while, you know I don’t talk about statistics without showing you how to do the math. Keep reading if you’re interested in learning more about expected value and combinations. 69C5 = 69! = 69! = 69 x 68 x 67 x 66 x 65 x 64! 5! x (69-5)! 5! x 64! 120 x 64! That comes out to 11,238,513 combinations of white balls. If you have this much money lying around, please send me an email. Finding all possible combinations is fairly straightforward. Since our prize depends on how many balls we correctly match, however, we want to find out how many different ways we can “hit” exactly n white balls. To calculate the other combinations, let’s think about things differently. Each of the 69 white balls will fall into one of two groups: “winners” (population: 5) and “losers” (population: 64). Let’s say I pick n winners. The remainder – 5 minus n – must be losers. When we multiply those two values together, we see how many total combinations there are where you match n winning white balls. 2! x (5-2)! 2! x 3! 2 x 3! 3! x (64-3)! 3! x 61! 6 x 61! …which means there are 416,640 different ways you can hit exactly two white balls. Here is the full table of combinations. Next, we’ll plug in the prize values to see how much we’ll expect to win. For the jackpot, I’m going to use the $496 million “lump sum” payment the winner can select. of your “investment” in tomorrow’s Powerball jackpot, for a profit of just over $5 million. Ah, but there’s that old catch: if you buy every single combination then have to share the jackpot, you’ll actually lose about $240 million – and it’ll be worse if more than two players correctly pick all six balls. And then, once again, there’s taxes – maybe you can write off all of your non-winning tickets as ‘losses’, but perhaps it’s better you talk to a professional. Click to continue to part two of this Powerball series. What I would like to know is how many combinations were still left unchosen. Regarding “your numbers don’t matter”, don’t you think that, because some percentage of people play their birthdays, their family’s birthdays, etc., that your odds of having to split the jackpot with someone are higher if you play low numbers (<=12, <=31), so you would slightly increase your expected value by playing higher numbers? Granted, we don't know by how much, but it would seem that it's probably a little bit. Yes, probably increased odds that you’ll split on lower numbers. But you’d have to hit all six numbers first, which is where the real problem lies. Don’t forget about taxes too (although the hypothetical person who bought a huge enough number of tickets to make deducting them worthwhile could use that to offset the taxable amount). Yes, taxes are really only an issue *after* you win. I suppose there could be an upside for deducting after a big loss but I’m guessing most readers won’t find that useful. Doesn’t the best-case scenario also include 25 wins of $1 million and all the combinations of the smaller wins as well? Probably doesn’t push it past the tipping point, but still to be considered. Yes, the total for the best-case scenario includes all of the non-jackpot prizes. Yes, that’s the story I read as well. As you say, they were able to orchestrate purchasing only 5 million tickets (out of 7) … you’d need a lot more tickets for this one, but you’d also have a lot more stores to work with. I just don’t understand how they manage to “hire” all the people necessary to fill out the forms and do all the purchasing without having to split the jackpot too many ways. -shrug- Large numbers are fun. I’ve been thinking about that a bit today – I assume they printed out as many cards as they could in advance and gave them to their package-carriers, who would take them to the stores to be scanned. Too many possibilities for mistakes (and way too time-/$-consuming) if done manually. I was living in Fredericksburg VA at this time and I had organized a small ticket pool for my co-workers and myself. You are correct that the group from Australian group used preprinted tickets. They also monopolized the machines at many locations to the exclusion of many irate “regular folks”. Following this incident, the VA lottery changed their rules so that players could not use pre-printed slips and that players buying “large blocks” of tickets could not monopolize the machines. Also, that lotto drawing was held once a week, so the time they had to do all was a little longer than the twice a week cycle you have today.